At the centre of the Tower of London stands the Norman White Tower built in 1078 by William the Conqueror (reigned 1066-87) inside the southeast angle of the city walls, adjacent to the Thames. This was as much to protect the Normans from the people of the City of London as to protect London from outside invaders. 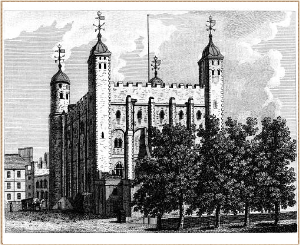 In the 1190's century, King Richard the Lionheart (reigned 1189-99) enclosed the White Tower with a curtain wall, and had a moat dug around it filled with water from the Thames. The tower has served as a royal residence, a state prison, a zoo, a mint, and a armory. But perhaps its most infamous use was as a torture center. Hundreds of people died here, most of them by judicial murder rather than the due process of law.